The peach ‘Nectar’ variety is an outstanding white, freestone fruit. The “nectar” in the name refers to its amazingly sweet flavor and soft flesh. Nectar peach trees are fairly tall but there are semi-dwarf trees available. These plants are prolific producers with good care. Keep reading for some info on how to grow a nectar peach and management tips. Peach season is a treat. Nectar peaches are considered mid-season fruits with harvest dates from early to mid-July. They are one of the more popular of the white peach varieties, noted for their creamy flesh and delicious juice-on-your-chin flavor. 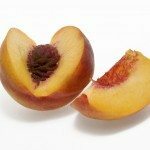 Like most stone fruits, Nectar peach care is minimal once established, but young plants need some training and a little TLC to develop correctly. This tree originated in Bakersfield, CA by Oliver P Blackburn and was introduced in 1935. While full sized trees can get up to 25 feet (7.6 m.), the semi-dwarfs remain just 15 feet (4.5 m.) in height. The peach ‘Nectar’ variety is reliably hardy to United States Department of Agriculture zones 6 to 9. In colder regions, the semi-dwarfs can be grown in containers in a greenhouse. The fruits are large and have that peach perfect blush on the fuzzy skin. The pure white flesh is tinged pink where the easy to remove stone rested. This is a good peach for fresh eating but also for baking and preserving. 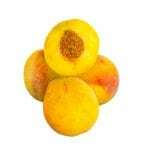 Nectar peaches are self-fruitful but do need a region that will provide at least 800 hours of chilling time. Light, well-draining, slightly sandy soil is perfect for Nectar peach growing. Full sun sites promote the development of the showy flowers and resulting fruit. Choose a site with some wind protection and avoid planting where frost pockets develop. Young trees may need staking and some judicious pruning to form an open canopy with strong peripheral limbs. One of the main tips on Nectar peach growing is to provide plenty of water. Keep soil evenly moist but not soggy. Feed peach trees in early spring annually with well-rotted compost or a 10-10-10 formula. You may also use liquid kelp on the foliage every 3 to 4 weeks, but be cautious and only spray when leaves will have time to dry before nightfall. This will help prevent fungal diseases. Prune trees to promote an open center, vase shape. Prune in early spring before buds appear. Peaches produce fruit on 1-year-old wood. Rub off unwanted shoots as they appear to prevent heavy loads at the end of the branches. Cut back 1/3 of the wanted branches each season. Mulch around the base of the tree to protect the root zone from freezes, conserve moisture and prevent competitive weeds.